At the author's request, no ebook is available. "We are always scanning the horizon for inspiration, for models of enterprises that have already successfully done this. One that has appeared, a shining beacon on the horizon, is Pocheco, the envelope factory with the beehives on the roof. A business that puts its minimisation of water, waste and energy use at the heart of what it does. That thinks through its use of materials and strives to walk as lightly on the earth as possible. It took phenomenal imagination to create an industrial revolution in the first place, it will take something similar to create what happens next. That’s what I love so much about the story of Pocheco. It doesn’t present the process of stepping forward responsibly into the future as being a dour process of doing without and slowly returning to live in caves. 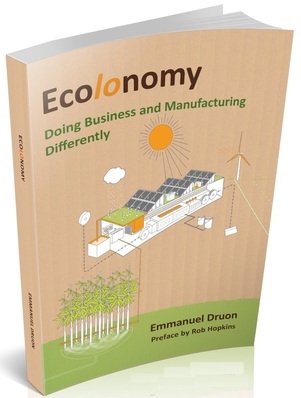 It is about a visionary, Emmanuel Druon, setting out to reimagine Pocheco from the ground up, reducing its environmental impact, preventing pollution, reducing risks at work and lowering the burden of work, and making a financial profit by improving the productivity of the organisation." Trailer for 'Demain - le film', which features Emmanuel Druon amongst its many inspiring creators of possible futures for the world. “It makes better economic sense to do business ecologically!” So says Emmanuel Druon, the successful businessman and ‘green’ visionary. For the last 20 years, Druon has been practising what he preaches as CEO of the French envelope manufacturer Pocheco. In that time he and his staff have developed the idea of ‘ecolonomy’ – an approach to business that is based on strict environmental and ethical principles and which is sustainable and commercially profitable. In other words, it makes both economic sense and ecological sense. In this radically inspiring little book, Druon tells the story of Pocheco, outlines the key decisions his team has taken and the effect they’ve had. He recalls many of the problems they faced and the astonishing solutions they found. The book shows how any business can rethink its buildings, its products and services, transport, suppliers, sales, relations with the community, employment practices... and revolutionise its whole business practice. For readers in any organisation of any size looking to make a difference, this is a good, practical and hopeful place to start. This is a book for anyone working in a small or medium-sized business (from the CEO down) who wants to know how to 'green' the business - making its whole approach sustainable and ethical and minimising its impact on the environment.